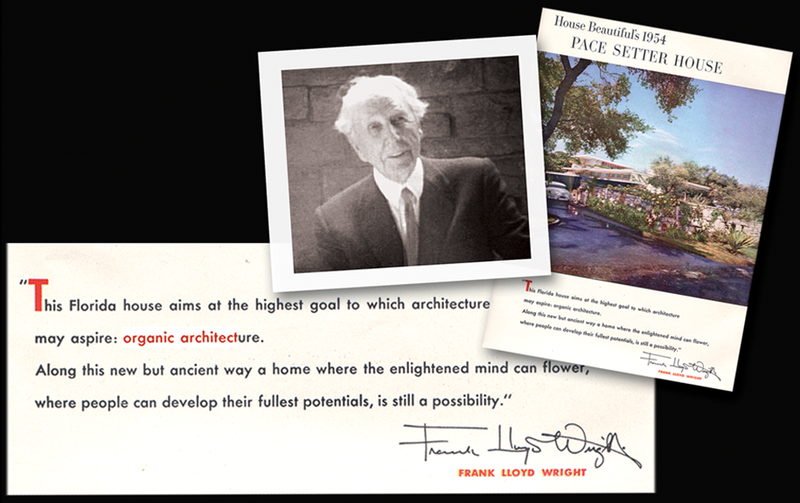 Frank Lloyd Wright began using the phrase “organic architecture” in the early 1900s. He looked to nature and saw all was part of the whole. In Frank Lloyd Wright’s architecture the structure is part of the surroundings, the interiors part of the structure. For many of his buildings he also designed furniture, table-ware and tapestries – nothing too small to integrate into the organic whole. Frank Lloyd Wright and Alfred Browning Parker corresponded from 1939 until Wright’s death in 1959. In November 1953 in House Beautiful magazine Wright gave Parker’s “Pace Setter House” design his highest praise, calling it “organic”. This Florida house aims at the highest goal to which architecture may aspire: organic architecture. Along this new but ancient way a home where the enlightened mind can flower, where people can develop their fullest potentials, is still a possibility. In part 3 of 10 Things To Love personal letters & professional papers will document the correspondence of the architects. It will reveal the unique and touching relationship between the mentor, Frank Lloyd Wright, and mentee Alfred Browning Parker.